Ever find yourself in the cockpit punching GPS buttons multiple times to get it to do what you want? Our recent GPS survey found that more than half of readers have difficulty some of the time getting a GPS to do what they want. I spend hundreds of hours each year teaching only in aircraft with advanced GPSs and autopilots and I became convinced that there was no one good reference for pilots teaching them everything they need to know about GPS, WAAS and operating their GPS receivers. So I decided to write the one book that tells pilots what they need to know to safely fly using a modern GPS receiver. If you’d like, skip on below to see what Rod Machado says about my new book. Or order now! that GPS is at the center of modern cockpits and not just add-on equipment. If you fly VFR or IFR with a panel-mounted GPS, you’re bound to learn something you didn’t know from my latest book about GPS, WAAS or operating your GPS receiver. It’s a totally new book—NOT a new version of my G1000 book—that tells you what you need to know to safely operate modern GPS systems including detailed, step-by-step instructions for the Bendix/King KLN 94, Garmin GNS 430, 430W, 480, 530, 530W and G900X, G1000 and Perspective glass cockpits. Don't Get Stuck in the Clouds Wondering Which Button to Push! I start the book by explaining the details of how the GPS satellite navigation system works. Next I go into the details of the new infrastructure that was built to create WAAS, the Wide Area Augmentation System. I also explain all of the new WAAS-based approach minimums: LPV, LNAV/VNAV, LNAV, LNAV+V, and LP and the “gotchas” involved in flying these approaches. Finally I give detailed instructions for operating the most popular panel-mounted GPSs and how to use an autopilot when flying approaches. Throughout the book, NTSB reports and NASA Aviation Safety Reporting System pilot reports are used to illustrate pitfalls in using—and misusing—GPS equipment. Dozens of practical GPS and IFR tips, gleaned from the industry’s most experienced flight instructors are clearly displayed in the margins. Experienced pilots pilots may be surprised to learn why you should always load an approach with an IAF—even when receiving vectors to final. They’ll also learn why what they used to do with the SUSP key will now get them in trouble when loading an instrument approach. But there’s lots more. The big differences between the Direct-to key and using a flight plan. Getting started entering flight plans. The myth of needing to "activate the approach". Why you’ll never want to load an approach with an IAF—even when receiving vectors to final. When to Load versus to Activate an instrument approach. Why pushing the SUSP key gets you in trouble when loading an instrument approach. How to fly ALL instrument approach types. Why checking RAIM alone isn’t sufficient with a WAAS-capable GPS receiver. How to use your autopilot along every step of the approach. Why your autopilot may fail to couple to an ILS glide slope. Why some missed approaches begin before a GPS counts down to zero. Details on new minimums: LPV, LNAV/VNAV, LNAV, LNAV+V, and LP. How to tell if a GPS is certified to use new WAAS-based approaches. Different regulations that apply to WAAS-based GPS receivers. Loading airways and flying GPS-based T- and Q-route airways. Here's what Flight Instructor, Author and National Aviation Safety Counselor Rod Machado said about the book after I sent him an advance copy. 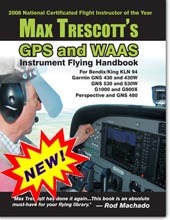 “Max Trescott has done it again with the publication of Max Trescott’s WAAS and GPS Flying Handbook. This book is an absolute must-have for your flying library if you’re an instrument rated pilot or are working on your instrument rating. It’s a comprehensive, no-nonsense guide to understanding and flying GPS approaches. 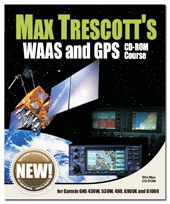 Max takes you from the basics to the advanced aspects of WAAS based GPS approaches and covers the nitty-gritty details that are oh-so necessary to safely use today’s sophisticated GPS equipment." Thank you Rod! Click here to order online. Or, you can order 24x7 by calling 800-247-6553. The price is $39.95 plus shipping. As readers know, modern technology is rapidly changing the avionics used in both old and new Beechcraft, Cessna, Cirrus, Diamond, Mooney, Pilatus, Piper, TBM and other General Aviation aircraft. As a result, the complexity of GA cockpits has increased to the point where pilots now need separate GPS and autopilot training. Operating the equipment is not intuitive and safety dictates that pilots understand how to get the most out of a modern GPS receiver. 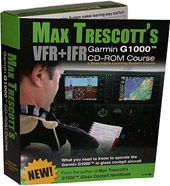 After you’ve read the book, call to set-up training with Max or other senior CFIs in advanced aircraft. Glass Cockpit initial, insurance recurrent, and accelerated IFR training. Train in your aircraft or ours in the San Francisco Bay area or at your home base. Experts available on Cessna Caravan/G1000 and other turboprops. 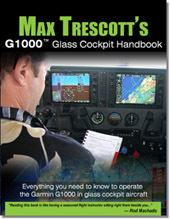 Get in-depth G1000, Perspective, or Avidyne training prior to your aircraft or jet delivery. Call 650-224-7124 to Schedule Your Training Today!